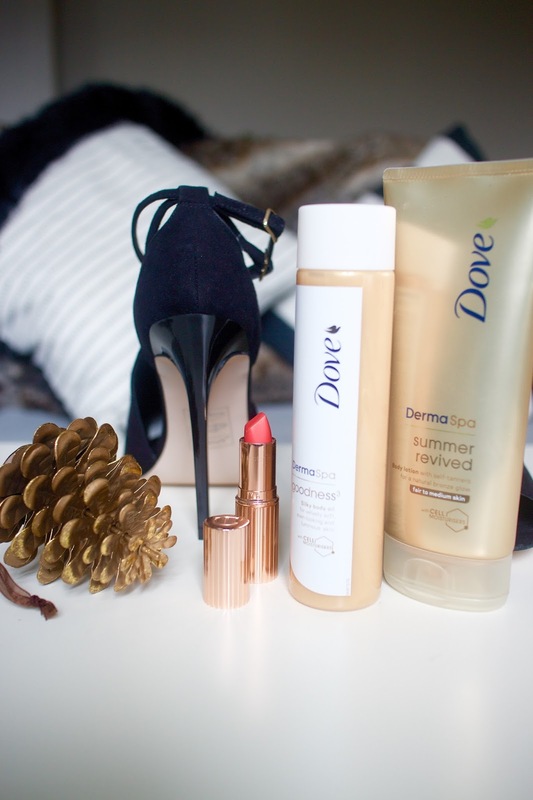 Whilst it may not exactly be 30+ degrees outside, I can't dare to bare my legs in a sparkly legs without a faux glow! A deep set tan isn't required, but I think a subtle glow can certainly finish off your look and transform you into a Gigi Hadid lookalike. First up, I start with the Dove DermaSpa Summer Revived Body Lotion* which offers a subtle, yet build able, sun kissed glow. I'm a big fan of their original gradual tanning lotion but there's something about the new DermaSpa formula that just works even better. Two applications (the first applied a few days before the event) makes for the perfect festive glow, and yes, no biscuity smell either! This next step however is just the ultimate festive party product in a bottle. I'm absolutely obsessed with the Dove DermaSpa Goodness3 Body Oil*, which is essentially the most perfect, golden shimmer in a bottle. It offers a gorgeous, luminous glow which, when applied to 'high points' of your body such as your shins, collar bone, shoulders makes you look like a total supermodel. As the shimmer is diffused in an oil too, your skin will be nourished and glowing all at once, which is pretty fine! Slip on your favourite hells, and throw on your finest party dress and dance the night away - you've got the legs for it anyway! Do you enjoy getting glammed up over the festive period? Are you a fan of a faux glow during Winter? Are you excited for Christmas? !